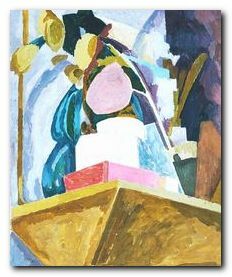 Vanessa Bell (1879-1961) is best known as the sister of Virginia Woolf – but in fact she was a talented artist in her own right. She was born in May 1879 at Hyde Park Gate, in central London, the eldest of four children of Leslie Stephen, a Victorian scholar and writer, and his second wife Julia Duckworth. Vanessa like her sister was largely educated at home, but they were both encouraged to develop their individual talents. Vanessa started having drawing lessons, and in 1899 she entered the Royal Academy. Following her mother’s death in 1895, Vanessa took on the role of housekeeper for the family. Her father, Sir Leslie Stephen, was rather demanding, and Vanessa struggled to balance this domestic role with trying to develop her artistic interests. However, her father died in 1904, so she was released from this responsibility. The family home was sold and she moved with her sister and two brothers, Adrian and Thoby, to a start a new and emotionally more liberated life at 46 Gordon Square, Bloomsbury. The move to their new home enabled Vanessa and her sister and brothers to entertain their own friends. On Thursday nights Thoby invited his literary friends from Trinity College, Cambridge University to the house, and Vanessa started the ‘Friday Club’, a meeting for artists. 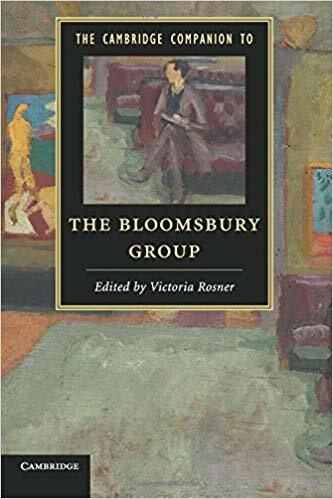 The Bloomsbury Group grew out of these meetings of artists and writers. Vanessa Bell, Frances Spalding’s excellent biography, records the effects of this liberating move. One of Thoby Stephen’s friends at university was Clive Bell. In 1905 he asked Vanessa to marry him, but she declined. She also rejected a second proposal from him a year later. (Virginia did the same with Leonard Woolf.) Her reasons were that although she valued his friendship, she did not want to be married. However, after the sudden death of her brother Thoby from typhoid fever in 1907, she changed her mind and accepted him. 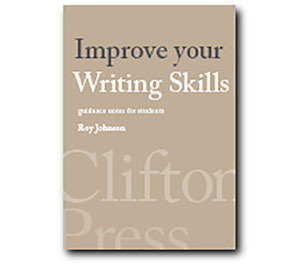 They had two sons – Julian and Quentin – both of whom went on to become writers. Vanessa continued to paint, but her time was increasingly taken up with looking after the children. In 1910 they met Roger Fry when he came to speak at the ‘Friday Club’, and the following year they went on holiday with him to Greece and Turkey. When she became ill on holiday, Fry nursed her through the illness, and they started an affair. She and Clive nevertheless remained friends, and Clive continued to support her financially, but he resumed a relationship with a previous mistress. Such is Bloomsbury, and there is more to come. Another artist who joined the Bloomsbury Group was Duncan Grant. Vanessa admired his work and bought one of his paintings. The Art of Bloomsbury shows via beautiful colour reproductions how Bell, Fry, and Grant influenced each other. In time she became close to Grant, and despite the fact that he was a promiscuous homosexual, she started an affair with him. This displaced Roger Fry, who was miffed but remained friends and part of the Bloomsbury Group. She and Duncan Grant were devoted to each other and lived together for the rest of her life. They had a daughter, Angelica, who they pretended was the daughter of Vanessa’s husband Clive Bell. This deceit was maintained until the girl was nineteen years old. She records her own account of this dubious episode in her memoir Deceived with Kindness. During the First World War, Vanessa and Duncan Grant moved to the Sussex countryside, so he could avoid conscription. They rented Charleston Farmhouse, and moved there in October 1916 with Vanessa’s children and also the writer David Garnett, who was Duncan’s current lover. Duncan and Vanessa chose rooms for their studios at Charleston and immediately started to decorate the house. The walls, fireplaces, door panels, and furniture were all decorated to harmonise with their paintings, and Omega fabrics and ceramics were incorporated into the overall décor. Clive Bell came to visit his sons, and Virginia and Leonard Woolf lived only four miles away. Other guests included Maynard Keynes and his wife the Russian dancer Lydia Lopokova and Lytton Strachey and his sisters. Amateur dramatics were a popular form of entertainment at Charleston. There were a number of pageants and drama shows put on between the wars – what came to be called ‘The Long Weekend’. Virginia Woolf satirises a country house pageant in her last novel Between the Acts. The thirties were a time of personal difficulty for Vanessa. Roger Fry, with whom Vanessa had remained close, died after a fall in 1934, and in 1937 her son Julian was killed while serving as an ambulance driver in the Spanish Civil War. More unhappiness followed with the suicide of her sister Virginia in 1941, and estrangement from her daughter Angelica in 1942. This was caused by a twist which illustrates the complex personal relationships amongst the Bloomsbury Group. Angelica discovered the truth about the identity of her real father only when she was nineteen, and then much against her mother’s wishes, and in a manoeuvre which you do not need a brass plaque on your front door to understand, she married David Garnett, her father’s former lover, who was twenty-six years older than her. Charleston became a full-time home again during the Second World War as it was safely out of reach of the bombs falling on London, and Vanessa continued to live there for part of each year until her death in 1961. Duncan kept the house on for a few years longer but it was too large for him and he eventually moved out. The house is now maintained by The Charleston Trust who have renovated and opened it to the public. Frances is a she, thus her name has an e.
just a typo, I’m sure. thanks for sharing this bio. Point taken. Many thanks. Typo corrected.